"What a spot. Home of another perfect moment (very rare). Enough can't be said about the food. The fishing was magic! The scenery and wildlife were spectacular. Would I come back? You Boettcher!! " 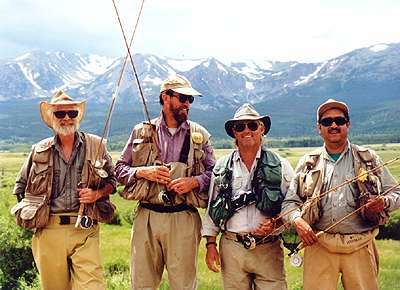 The Old Boettcher Lodge offers discriminating fly-anglers easy access to some of Colorado's finest wild trout fishing. Numerous large and colorful browns, brookies and rainbows inhabit our rivers, streams, mountain lakes and countless beaver ponds. We are able to keep fishing pressure extremely light. 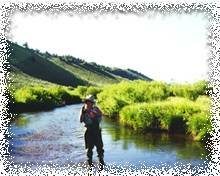 On our scenic Park Range Ranches, many miles of tumbling freestone streams and beaver ponds feed the North Fork of the North Platte River (a Gold Medal River) as it meanders through lush hay meadows and rich grasslands. Here, about 30 private miles of deep pools and shallow riffles hold trophy-sized brown trout up to 24 inches long. Within casting distance from the Lodge, smaller brookies and native cutthroats inhabit tributary streams and a string of beaver ponds, some measuring three acres or more. By horseback, a one or two hour ride takes you to Blue Lake and Twin Lakes at timberline. These locally renowned waters hold large rainbow and mackinaw trout, and our excellent guides will assist you with the deep-water tactics necessary to tackle these monsters. During your stay, you should spend at least one day by these magnificent mountain lakes. If you're in the mood for a different kind of adventure join us in our drift boat for a trip down the Platte into Wyoming waters. June: You can expect plenty of high water due to run off. Wooly Buggers and deep nymph techniques work well. The end of June brings the start of dry fly fishing. Emerging Stoneflies and Caddis ensure an abundance of rising fish. July: Here come the Mayflies! By this time the fish are looking up. Great dry fly fishing from late morning until evening, not to mention great spinner falls and early morning Caddis. August: Days are long and Mayflies are still abundant. You'll find Tricos and Hoppers, along with other Terrestrials (Ants and Beetles). September: Chilly mornings and nights, warm middays.... the perfect combination for Blue Winged Olives and the bigggest fish of the season. From 2:00 to 4:30 PM is the best Hopper fishing of the year. "The undercut banks, deep oxbows, and long gentle glides of the North Fork are characteristic of a classic spring creek, and the browns are fat and scrappy. After my first fish, I grabbed a bigger rod and my landing net." Outdoor writer, Chuck McGuire, on his first visit to Park Range Ranches. For your comfort and convenience, The Old Boettcher Lodge provides professional guides, gentle horses, and sturdy company vehicles. We also include all the appropriate flies, equipment and tackle necessary to enjoy the various types of angling Park Range Ranches offers. If you'd like to tie your own flies, we provide materials and instruction. Our chief guide is Bob Wills, previously manager at Al Caucci's Delaware River Club Fly Fishing Resort. Bob has many years of experience as a fly casting instructor and working with fishermen at all levels of expertise, novices to pros, 8 to 89 years old. He knows where the big ones are and what they're in the mood for. From beginners just learning to cast over the open ponds to the most discriminating dry-fly stream-fishing enthusiasts, Old Boettcher Lodge offers the angling experience of a lifetime. All fishing is catch-and-release with barbless hooks (except for brookies in overpopulated beaver dams, for fish-fry night).